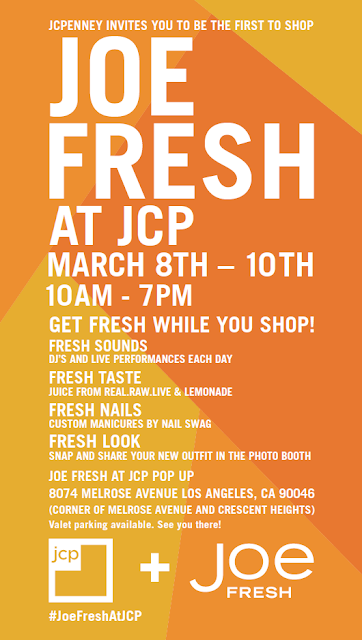 Small 4 Style: Joe Fresh for JCP in LA March 8-10! Joe Fresh for JCP in LA March 8-10! After posting about Joe Fresh for JCP yesterday, I got the word that there will be a pop-up shop in Los Angeles March 8-10! I wish I lived in LA because I would be there in a heartbeat. The collection is so cute, and I can't wait to see it in person. If you're going to LA for spring break or live there, make sure to check out the Joe Fresh pop-up shop! If you live in Dallas like me, check out the JCP store in Dallas. It is so pretty... you walk in and everything seems to sparkle. I got these awesome polka dot jeans that I am so excited about.